Certified Direct-Response Copywriting Specialists are uniquely qualified to help brands and businesses get people to take specific, measurable actions — driving them to make purchases or become sales leads. They are trained to write copy for offline media such as direct-mail letters, print ads, etc., as well as online marketing tactics such as emails, web pages, paid search ads. 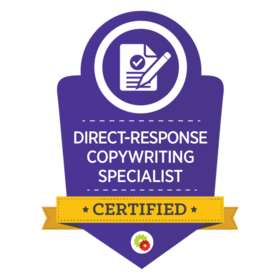 Recipients of the "Certified Direct-Response Copywriting Specialists" designation must complete an advanced, 6 module, 41 lesson online course and pass 5 quizzes and a final exam that tests on the full spectrum of direct-response copywriting methods and selling via the written word. When combined with the education, this final exam ensures the public that the recipient has attained a level of competence appropriate for professional practice.